After 16 years, its time for a change. As of Friday 22nd January 2016, the Millennium Stadium will be referred to as the Principality Stadium. 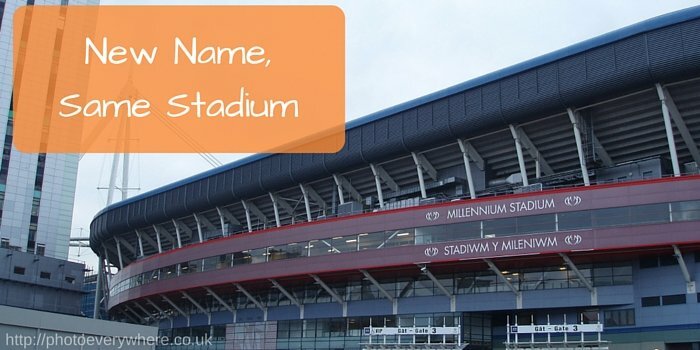 It has been known as the Millennium Stadium since June 1999, and even with the new signs in place numerous people not just in Cardiff and Wales but also across the UK and Europe will always know it as the Millennium Stadium. The stadium was built as a redevelopment of the previous National Stadium and as part of the redevelopment of west Cardiff. With Wales winning the bid for the 1999 Rugby World Cup, it was vital that the old stadium was either updated or that they built a completely new stadium, to accommodate the event. The reason for the change of name is after a multi-million pound naming rights deal was signed in September 2015, after a long 10 months of negotiations, and years searching for the best partner. The signs for the new stadium went up at the beginning of 2016 ready and are bigger and bolder than the previous Millennium stadium signs. Our Cardiff Self Storage centre was honoured to be selected as the storage supplier for all the alcohol and non-alcohol related dispensers, chilling and refrigeration equipment for the Heineken Cup final in 2014. This was such a historic game as not only was it between two of the best team in Europe, Toulon and Saracens, but it would also be the last game in the UK for Jonny Wilkinson. It will be upsetting to no longer see the Millennium Stadium signs outside but it will be a step in the right direction for Welsh Rugby. The first match to be played at the renamed stadium will be Wales verses Scotland in the Six Nations clash on 13th February.